A Florida Man charged with killing a Chihuahua with a floor scraper told cops that there was a “strong magnetic force between him and the dog and the dog had to go,” according to a police report. 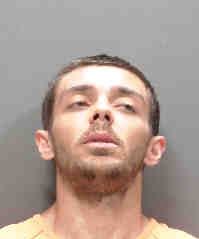 Aaron Merwine, 27, was arrested Saturday evening for killing the dog, named Lucky, at his residence in Venice, a city outside Sarasota. Merwine, who works as a packer at Walmart, is locked up in the county jail on multiple felony charges. The dog’s owners adopted the dog from Merwine’s family and had brought the eight-pound canine back to the residence for a visit. A witness told cops that Merwine used the scraper to stab the Chihuahua five times. “The scraper still had blood and dog’s fur on it,” reported cops, who obtained the item from a neighbor who took the scraper from Merwine, who is pictured above. Merwine “appeared under the influence of unknown intoxicant,” the police report states. Merwine is expected to undergo a court-ordered competency evaluation in advance of his May 10 arraignment. Outfitted with a steel blade, a broom-length floor scraper can be used to remove old flooring, tiles, and adhesive residue.